Phew! Easter feels like it snuck up on me a bit this year. Our place is finally spring ready and I have been having fun looking for little treats for my girl. You guys unanimously requested a gift guide for littles over on Instagram and I’m so excited to share it with you today. And since we are less than two weeks away, don’t worry- everything here should still get to you in plenty of time! I love playing Easter Bunny and I am just about done with the goodies I’ve collected for Ms. Olivia. I always grab a few $1 finds from the Target dollar bins, like stickers, a mini lego set, bunny ears, etc. And then I like to include a book and a few special things for our girl. I try to include a thing or two she needs for the upcoming season— little ballet flats, new sunnies, etc. when I can. 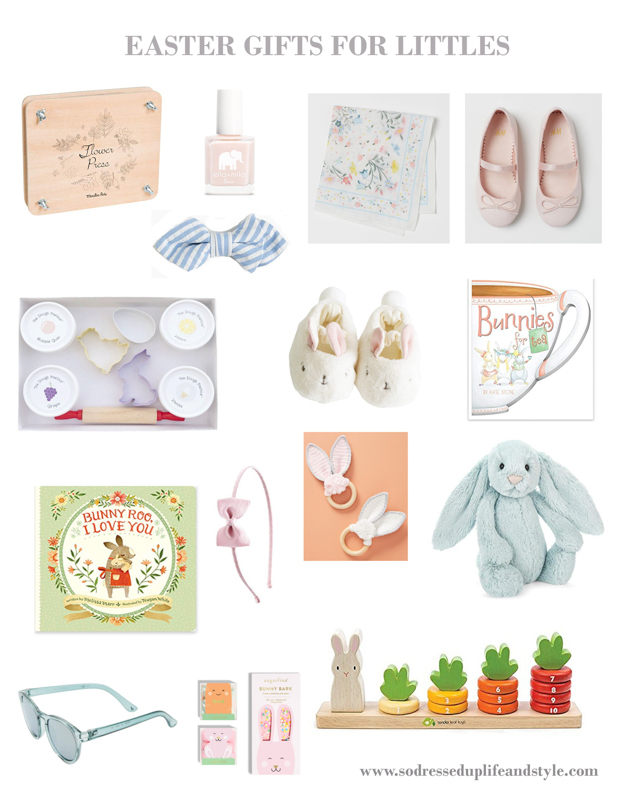 This season is one of my favorites and it’s always hard for me to narrow down my favorites finds…but here are some sweet ideas for boys and girls I just love. I hope you do too! Flower Press: This is such a sweet gift for a nature enthusiast. I can picture so many park, nature walk, garden adventures and then coming home to make keepsakes or art out of some of the treasures from our day. There is also a botanist set too. Non Toxic Nail Polish: Olivia loves painting her nails and this totally safe brand is our favorite. They make so many colors and lots of glittery options too. This would be such an unexpected surprise inside an egg. Bow Tie: There are few things cuter than a little boy in a bow tie on Easter and this one is especially darling. Cotton Scarf: I was so excited when I found this sweet floral scarf. It’s so fun for a little spring accessory (and only $4.99!) I can see it tied on a purse, around a sweet pony, as a tea party blanket for toys. I love it. Ballet Flats: Olivia loves the style of ballet flats and we usually get a couple pairs this time of year because she is so hard on her shoes. These are $12.99 which can’t be beat and they are darling. Play Dough Set: Admittedly, the type A in me just cringes at all the mixed colors and dried pieces left all over the floor ha! But play dough fosters such imagination and provides endless entertainment that we are always playing with it. I love this non toxic set that comes with adorable Easter themed cutters too. Bunny Slippers: These are perfect for baby’s first Easter! They are so precious I can hardly stand it! They come in pink and in blue. Bunnies For Tea: We always gift books at the holidays and this new to us book looks so incredibly sweet. I love that you can hold it like a teacup, too. Bunny Roo I Love You: This is a sweet classic for boys and girls. Headband: A sweet hair accessory is always a fun treat and I love this delicate little headband. Teether: I don’t know what’s cuter, the ears or the tail?! This is so fun for the tiniest ones. Bunny: Jellycat stuffed animals are our favorite! We have loved them since Olivia’s baby days and have so many different friends in various sizes and styles (though admittedly they’re all pink! :) ) They wash well and last forever. They are so soft and sweet. For babies and older kids, I really think you can’t go wrong with one of these! Sunglasses: Now that we’ll be spending more time outside, some adorable sunnies are a perfect treat. STEM Toy: This toy is so cute and just perfect for Easter. It also supports counting, stacking, color identification, and problem solving.